General Meeting: Saturday, April 11 at 9:30 am at the Buena Park Library District. META will meet at 8:30 am. Patricia Rivera is hosting our next chapter meeting. The Library Services for Latinos: A Professional Development Day workshop, which took place on April 3rd 2009 at the Orange Public Library, was a tremendous success! Inspiring presenters, informative workshops, and, of course, tons of books were prevalent throughout the day. Books from a variety of Latino/a authors on display. The event began with an inspirational speech from Rueben Martinez, winner of the 2004 MacArthur Foundation award, and owner of Martinez Books and Art Gallery. Rueben’s passion for books and his determination to serve the Latino community was inspiring, and, most significantly, his moving words were a vivid reminder for all librarians in attendance as to why libraries play a pivotal role in serving underrepresented groups. Simply put, an awe-inspiring speech to begin the day! Rueben Martinez captivates the library audience. Moreover, the event included a spectacular panel discussion with local Southern California authors Sarah Rafael Garcia author of Las Ninas: A Collection of Childhood Memories, Jamie Martinez Wood author of Rogelia’s House of Magic, and Reyna Grande author of Across a Hundred Mountains. A book signing occurred immediately afterward. 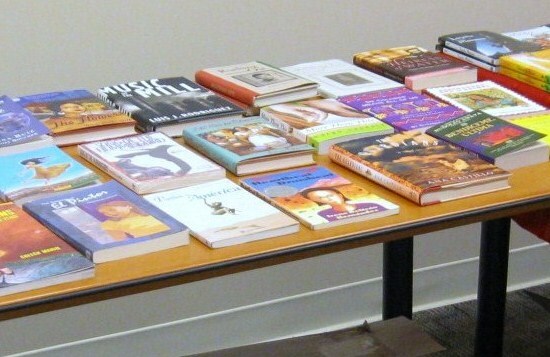 Must-have books for any collection serving the Latino community. Most notably, the Professional Development Day workshop would not have been remotely possible without the tremendous dedication of the REFORMA OC Coordinating Committee Members: Silvia Cisneros (Santa Ana Public Library), Irma Morales (Orange Public Library), Susan Luevano (CSULB Library), Patty Lopez (Santa Ana Public Library), Yolanda Moreno (Interim Director-Orange Public Library), and Milly Lugo (Santa Ana Public Library). The committee worked diligently in the planning and organizing of Friday’s workshop. Felecidades for a job well done! Over $400.00 dollars was raised for OC REFORMA library scholarships!!! For more pictures of the event, please access our photo album. Click on the picture below for direct access to the REFORMA OC photo stream. Click on pic for more photos!! !